The posterior cruciate ligament (PCL) is recognized as an essential stabilizer of the knee. This clinical sports medicine update reviews the current literature on the definitive role and recommended treatment of a PCL injury. Our clinical and biomechanical studies have demonstrated a clear benefit to double bundle over single bundle PCL reconstructions. Colorado knee specialist, Robert LaPrade, MD, PhD recently published a review article in the American Journal of Sports Medicine on the “Emerging Updates on the Posterior Cruciate Ligament.” This clinical sports medicine update presents a thorough review on up-to-date knowledge on the anatomy, epidemiology, biomechanical function, diagnosis and current treatments for a PCL injury. The emphasis of this study is on emerging clinical and biomechanical evidence regarding the current treatment choices for PCL reconstruction surgery. The PCL is composed of 2 bundles, the larger anterolateral bundle (ALB) and the smaller posteromedial bundle (PMB). A posterior cruciate ligament tear rarely exists in isolation. Typically, PCL injuries occur with anterior cruciate ligament (ACL), medial collateral ligament (MCL), or posterolateral corner (PLC) injury. The most common PCL injury originates from sports or trauma, most commonly motor vehicles or road traffic accidents. Obtaining an accurate diagnosis between an isolated versus a combined PCL tear is essential for long-term knee health and stability. The complexity of the PCL has generated controversy over the recommended treatment after injury. Historically, non-operative treatment was favored for an isolated PCL injury due to poorer outcomes postoperatively compared with anterior cruciate ligament reconstructions. Today, advancements in the operative treatment of this type of injury have made surgical intervention increasingly popular and successful for isolated and combined PCL injuries. PCL reconstruction surgery depends upon whether the injury is acute or chronic. Acute multi-ligament knee injuries with a concomitant or chronic PCL tears are believed to be best treated by surgery. Today, there are two PCL reconstruction surgery techniques, the single-bundle and double-bundle PCL reconstruction techniques. Single-bundle PCL reconstruction is typically indicated for symptomatic chronic PCL injuries, either in isolation or combined with other knee ligament injuries and for acute, multi-ligament PCL injuries. Double-bundle PCL reconstruction surgery has evolved as an alternative to single-bundle reconstructions with the same indications for surgery. Currently, peer-reviewed publications are lacking evidence-based level 1 clinical studies comparing the effects of single-bundle and double-bundle PCL reconstructions. However, level 2 and 3 studies have attempted to quantify potential differences between the two techniques. This study concluded that the differences between single-bundle and double-bundle tibial inlay techniques still need to be further evaluated with prospective clinical studies. Recent higher-quality studies indicate that transtibial double-bundle PCL reconstruction surgery may be able to more closely and objectively restore the knee to native levels than transtibial single-bundle reconstructions. “Our clinical and biomechanical studies have demonstrated a clear benefit to double bundle over single bundle PCL reconstructions. We look forward to further research in this area by others using the techniques we have developed because we believe that this will lead to much improved outcomes for patients with PCL tears,” said Dr. LaPrade. 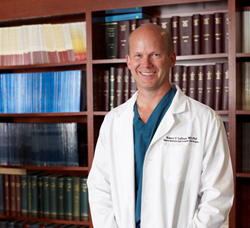 As a Colorado knee specialist at The Steadman Clinic in Vail, Colorado Dr. Robert LaPrade is among few complex knee surgeons in the world who specializes in the treatment of PCL injuries. Serving as the Chief Medical Research Officer at the Steadman Philippon Research Institute, Dr. LaPrade has published over a dozen studies on the PCL since 2013 and treated over 500 patients with PCL injuries.